David Burley from Frack Free South Yorkshire (FFSY) was at the August meeting to provide an update on fracking. 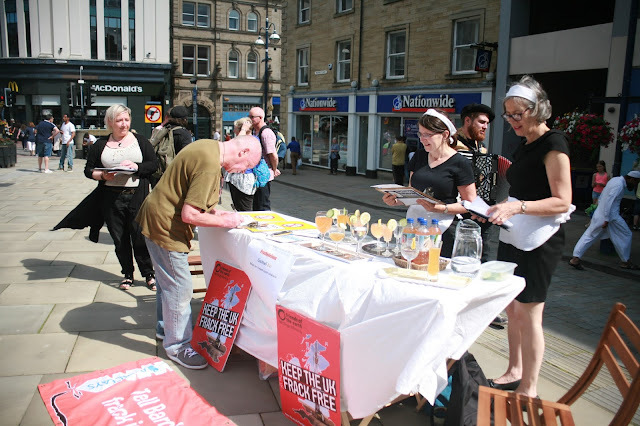 Huddersfield Friends of the Earth recently completed a toxic cocktail fracking stunt outside Barclays bank. See link here. David asked if we could do this in Sheffield, but unfortunately we are committed to too many other campaigns. We agreed to get involved with fracking actions if other groups are able to organise events. Feedback was given on the two stalls at Lowedges and Wortley Hall - they were both a great success with over 400 names collected on the Wortley petition. A Friends of the Earth survey shows that most people still don't want fracking even if they were given £10,000. It was stated that most people would lose that on property prices and the risk to health is not worth the money. See more about the survey here and here. FFSY are trying to obtain off-the-record views of councillors and will be presenting information to Lib Dem and labour groups. Richard asked if we should link up with Chesterfield groups if they form part of the Sheffield City Region. "Do your Street" has been a fantastic success with over 30,000 leaflets distributed in two months. Another 60,000 are to be printed. 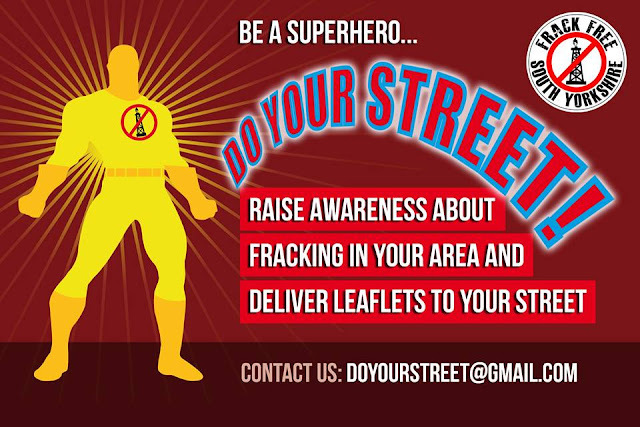 If you want to hand out some fracking leaflets on your street then please get in touch with FFSY.